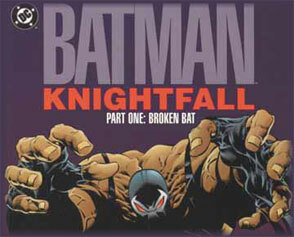 Knightfall, the Batman storyline in which Batman meets defeat. The aftermath of the devastating battle between Batman and Bane leaves Gotham City without a hero; that is until a new "Dark Knight" named Azrael appears. Azrael is a meaner, more violent version of Batman.